Firstly I would recommend reading the Microsoft docs article below. Software Library > Application Management > Global Conditions. 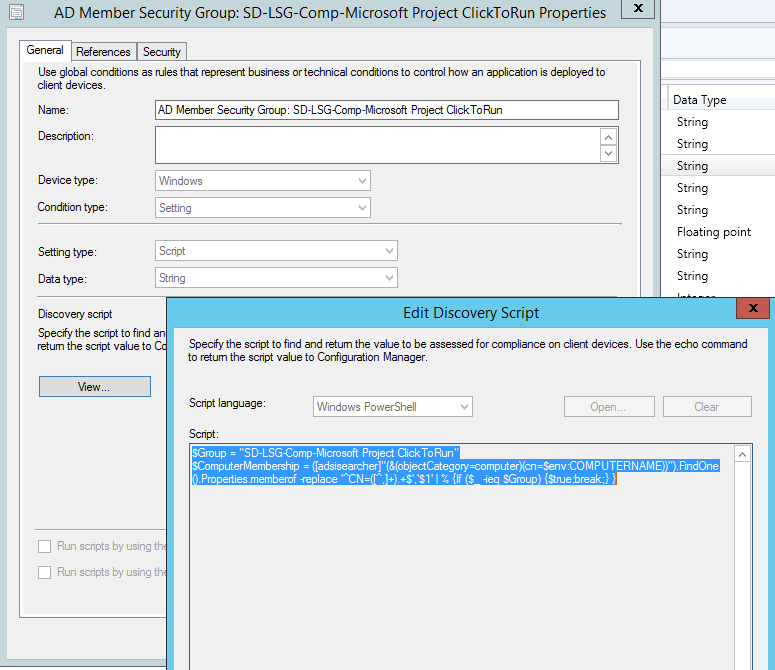 Scenario: I have an AD group "SD-LSG-Comp-Microsoft Project ClickToRun" with computer objects that should install Office 365 - ProjectProXVolume edition. 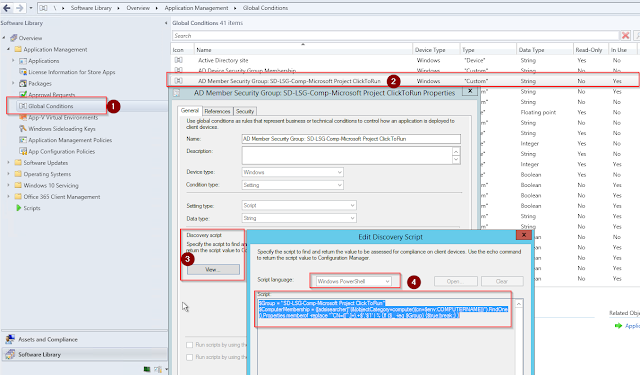 I wanted to create one application with multiple deployment types depending on their AD membership. 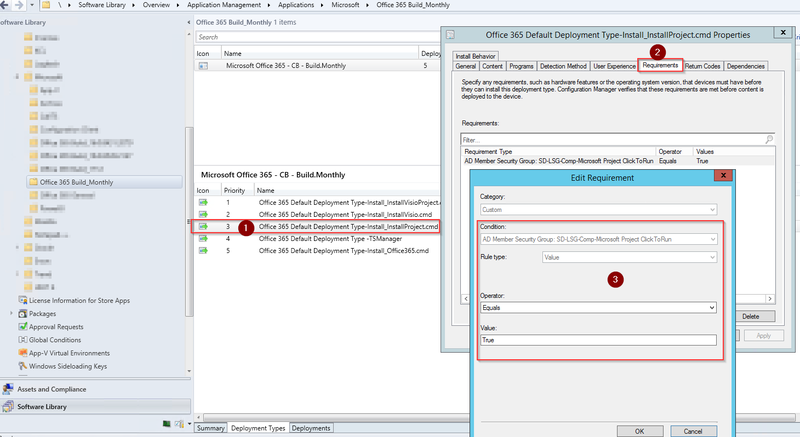 For example if the computer is only a members of the "SD-LSG-Comp-Microsoft Project ClickToRun" AD group then the deployment should only run the deployment Type "Office 365 Default Deployment Type-Install_InstallProject.cmd". This deplyoment Type calls the Office 365 setup.exe with a configuration xml detailing the <Product ID="ProjectProXVolume">. 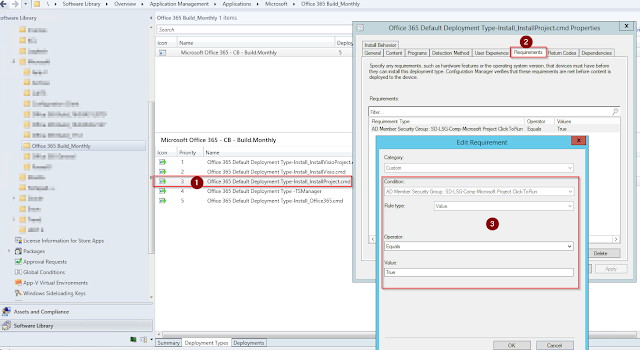 For the deployment to choose "Office 365 Default Deployment Type-Install_InstallProject.cmd" we need to create a global condition that will issue a $True value if the computer is a member of the AD group "SD-LSG-Comp-Microsoft Project ClickToRun". The global condition created below, will run a Powershell script on the local computer listing all the groups the computer is a member of and if one of the groups found matches the AD group "SD-LSG-Comp-Microsoft Project ClickToRun" issue a $true value and stop the script. $Group = "AD Group Name"
For the deployment to be linked to the AD group the deployment type "Office 365 Default Deployment Type-Install_InstallProject.cmd" must have a "Requirement type" set. We now simply set a the global condition created to equal True. 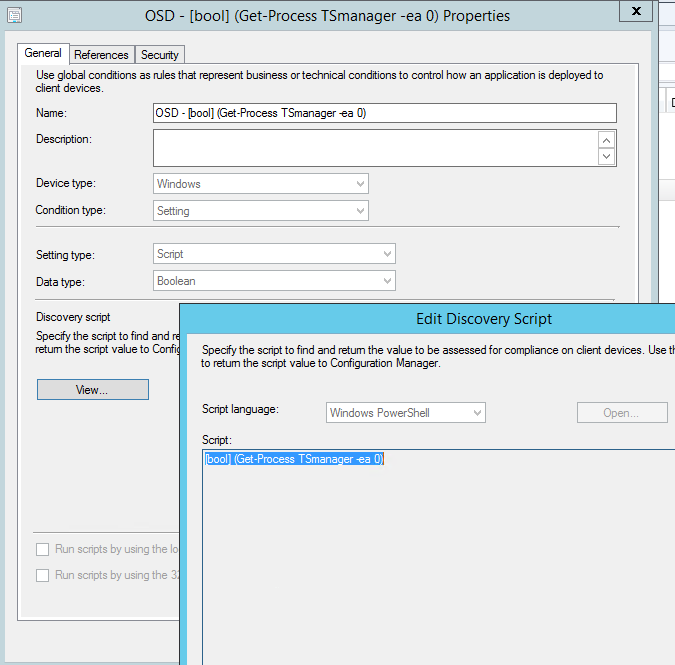 In my screen shot i have multiple deployment types for several scenarios i.e. 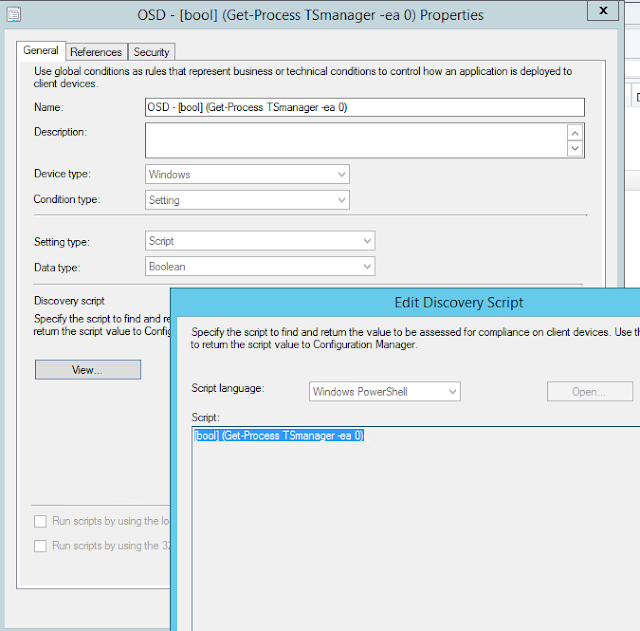 Visio and Project, Visio, Project, Office365, Office 365 during a Task Sequence. See Global Condition details below. $Group = "AD Group Name" #The AD group name to be filtered.